The Norwegian Getaway won’t set sail from its Miami homeport until February 2014, but early bookers receive a great deal if they’re ready for the commitment. Notice for those who like to be first: Norwegian Cruise Line has opened bookings for its Norwegian Getaway. The 4,000-passenger ship sets sail on Feb. 1, 2014, from Miami. It’s the largest ship to homeport year-round in that city. The Norwegian Getaway was named by a USA Today reader. 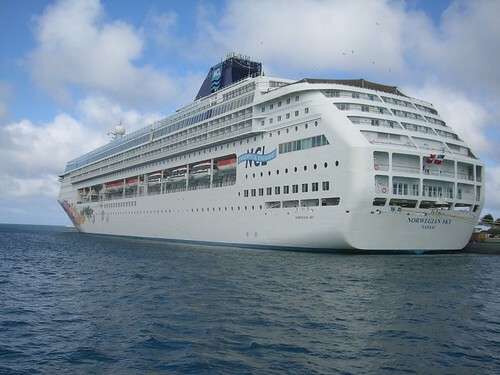 The above cruise is the Norwegian Sky. Photo by Julie Corsi. The Norwegian Getaway will cruise to the Eastern Caribbean, calling at St. Maarten, St. Thomas and Nassau. Fares start at $799 per person. The Norwegian Getaway is the sister ship to the Norwegian Breakaway, which is set to officially debut from its home port of New York City in May.